She was fierce as hell. I have to admit that sometimes she drove me nuts, but she was certainly never boring. And some of our best family stories revolve around her quirks, her skewed view of life, and especially around those mystifying pronouncements that she would regularly offer up as fact. 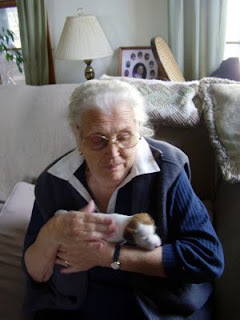 The Spousal Unit's mom passed away yesterday. She was one of a kind. We are heading to Ontario tomorrow for a few days, before rushing home to repack and drive the Resident Offspring to the west coast to begin her university career. So things will be a little silent in this corner of the blogosphere for a few days. Be nice to each other til I get back. We're all we've got. My condolences to you and the Spousal Unit. The best to you and your family. Take care! Best wishes to you and your in laws. Drive safe and tell us all about your adventures when you get back home. Sorry for your loss, Barbara! I think in-laws influence us almost as much as our spousal units, since they play such a role in shaping that person who attracts us in the first place. It's a fascinating dynamic. And yes, we are all we've got. Every year makes that more clear. My condolences, Barbara. Thinking of you all & wishing you safe travels. I'm so sorry to read this, especially having talked to you throughout the day. My condolences to you and your family, Barb. Safe travels. My sympathies, Barb. And give my warmest regards to the Spousal Unit. Quirks make the world go round. Have a couple of safe trips. Very sorry to hear of your loss, Barbara. My sympathies to you and yours. And what a wonderful picture of her to post! I'm so shocked to come on here tonight and see this, our sincere condolences to all of you. Take care, hold each other close and see you soon. Sorry to hear that Barb. She looks like a lil firecracker. Big hug to Jerry. And I likely spelled his name wrong, didn't I? Our sincere condolences. If there is anything you need just call. Thanks so much, everyone, for your kind thoughts. We had visitations yesterday, the funeral today, and everyone got along, and the whole thing went exceedingly well. We even had the most glorious blogger meetup(s) of all time. Barb, we remember Helen fondly, quirks and all, ESPECIALLY those quirks. A woman of great beauty who was not afraid to tell it like it is, or like she saw it! Our thoughts are with you, Jerry and Eva. I am sorry to hear that. I still remember her from when she was visiting you one Christmas and you had me over...She certainly was interesting. May her soul rest in peace. My heartfelt condolences to you and the Spousal Unit, Barb. Come home safe. How lovely to have all the pleasant and delightful memories to uplift you now and always. Blessings. So soon, so soon life passes - Mrs. O. was a truly beautiful woman with a good heart and willing to share in her own way. Hugs to all of you. Thank you, all, for your kind thoughts and actions. She had a good life, well lived, and she had a proper sendoff. She would have enjoyed it immensely. I'm sorry for your loss, Barbara. My condoloences to you and your husband. Take care.